Steve Kennedy receives the Neely Henry champions trophy Saturday from PAA President Dave Mansue. NetBait pro Greg Vinson had been on the hot seat for a while, sweating due to the gripping afternoon humidity and the thought that his catch might be enough to win. Vinson said it was "one of those days you dream about" as he compiled a tournament-high 17.92-pound limit Saturday on Neely Henry Lake. That included a 6.03-pounder, also biggest of the tournament, and all on a flipping bite that developed in super-skinny water. Vinson's total was 37.92 pounds. The final guy to the scale was Kinami pro Steve Kennedy, whose backwater bonanza almost bottomed out. He needed 9.69 pounds to overtake Vinson and clinch the win in the Bass Pro Shops PAA Tournament Series presented by Carrot Stix. It would be Kennedy's first win on the lake in 10 years or a superb and stunning upset by Vinson. The two Alabama anglers and friends stood watching the numbers. "It flashed 9 and a half, and I thought I had at least 10 pounds," said Kennedy, whose eyes got big when the first numbers hit. "Then it climbed up and finally settled." It settled ... just two-tenths of a pound better than Vinson's total, giving Kennedy a three-day finish of 38.12 pounds. 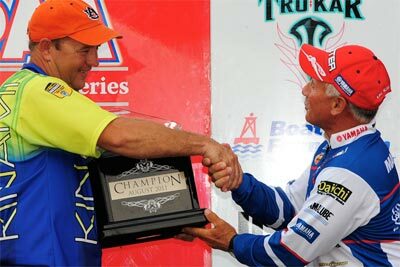 He won $5,000 and a new Nitro boat with a Mercury 225 Optimax and T-H Marine Atlas jackplate. "August and September are the only times when the place I was fishing really works," Kennedy said. "I've been excited for a long time to be able to come fish there again because it's been years. It wasn't right, in April, when the PAA was here in 2009 and one time my wife and I tried to get back in there and couldn't. "I love fishing out of my aluminum boat, too. It's just so much fun. Some people compare this (fishing) to NASCAR, but in that boat it's like rally racing or something. I love it." Running about an hour in his flatbottom rig to the way-way-way back of Canoe Creek, Kennedy threw the kitchen sink at the spots and largemouth in there. It got tougher each day, he said, due to him catching them and the banging and bumping of his boat. But it was worth it. He used a Kinami Flash, spinnerbait, Texas-rigged tube, swim jig with a Kinami grub, big-bodied and hollow-bodied swimbaits, and an old Rogue jerkbait that caught most of the fish the last two days. "That jerkbait is just what we do in summer on these small creeks and rivers," he said. "I learned that down in Georgia on the Flint River. We'd go every Sunday after church and throw jerkbaits in the little pools for shoal bass, which are about as close to spots as you can get. "These little rivers and creeks around here like Weogufka, Ohatchee and Cahaba are just a blast. That's where we go in summer, and when I'm on them I throw jerkbaits. They're the old floating baits. I just twitch them, make them wiggle a little bit. When the leaves start dying and falling, the jerkbait's not as good because there's too much stuff on the water floating along." If not for a Day 1 decision, this could have been Vinson standing in the spotlight with his near-18 pound bag and monster largie. "I had a decent bite and one big bite two of the three days," he said. "The first day, I made a big mistake staying on a group of fish that I thought might develop into something instead of going to what I knew was working. I stayed too long and then didn't really have time for the other, and that hurt me." Friday, Vinson figured out that he didn't need any current to get a big bite. He was flipping a black neon NetBait B-Bug on a 5/16ths Jethro's Tungsten weight in about 10 inches of water with grass. Vinson also threw the NetBait HB2 shakey head and a Lucky Craft 2.5 crankbait in chartreuse/brown. "Saturday morning I just went straight to that pattern and ran it in several areas on the lake," he said. "It was a day you dream about." Vinson won a Humminbird 898c Si Combo for the Humminbird/MinnKota Big Bass of the Tournament. Ranger pro Todd Auten clinched the PAA Angler of the Year title and brought in 13.77 pounds Saturday, pushing him to third place with 36.66 pounds. He threw a Phenix swim jig and an unidentified blade-jig vibrating bait around shallow docks and cover. He tipped each with a Zoom Super Fluke for a big-profile trailer to help attract bigger fish. "I think that size trailer helps minimize the smaller fish that try to get it," he said. "I was looking for shady areas about 4-5 feet off the bank, instead of the wider shade off the bank. It seemed those smaller areas put them closer to the bank. "Seawalls were pretty good, too, and several of my fish I caught around them threw up brown-orange crawfish in the livewell. I think the full moon last week probably had something to do with the crawfish and the fish were taking advantage of it around those walls."